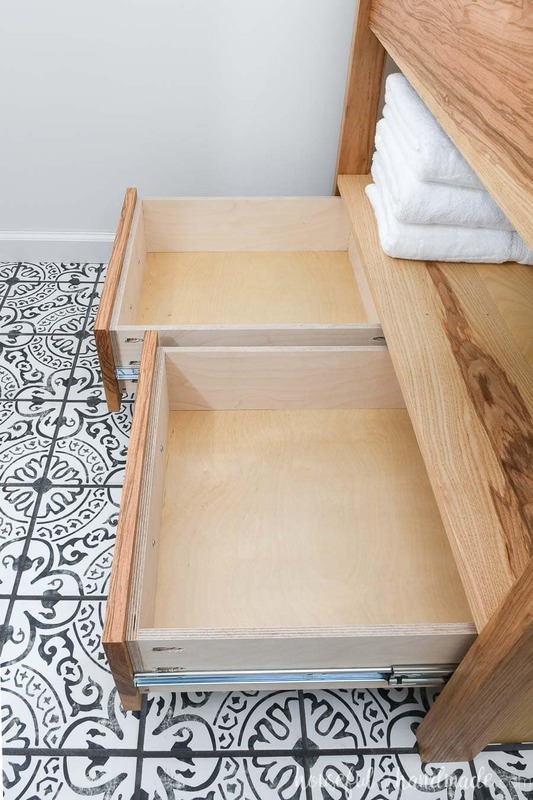 Update your bathroom by building a DIY bathroom vanity with large drawers. Remodeling a bathroom on a budget can be done! I know, this is the second one we’ve done in our current home (you can check out the master bathroom remodel here). One of the priciest parts of any bathroom is the vanity. But you can build one yourself and save tons! 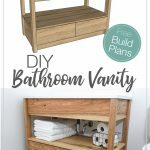 I partnered with Kreg Jig and their new project plan site, BuildSomething.com, to share the free build plans for this DIY bathroom vanity with bottom drawers. Now you can build your own bathroom vanity and save money too! Most people wouldn’t dream about building their own bathroom vanity, but after building the kitchen cabinets in our recent kitchen remodel, I learned that cabinets are not as hard as one would think. The trick to making a bathroom vanity, you need to take your time to be precise. Cut all your boards straight and ensure everything comes together at a 90 degree angle. Then you will have a wonderful bathroom vanity that you can show off to everyone! 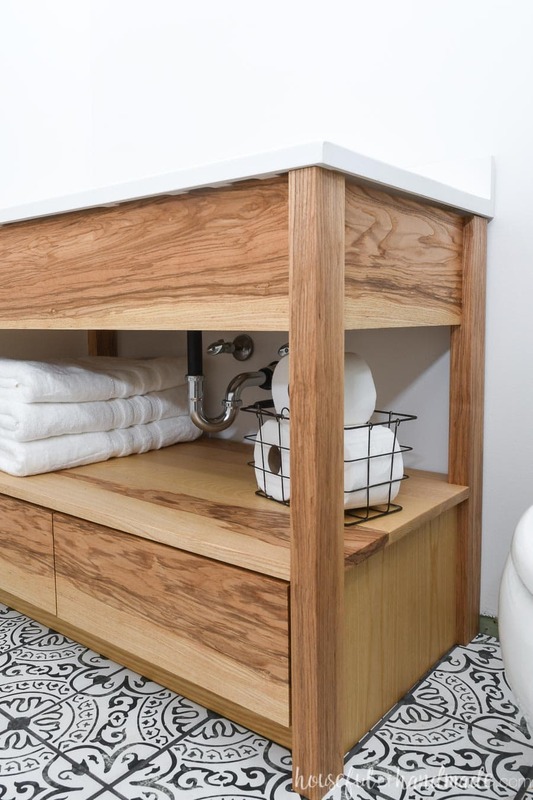 We wanted a space that was clean and modern, with a little rustic goodness thrown in. And what is more modern than open shelves? 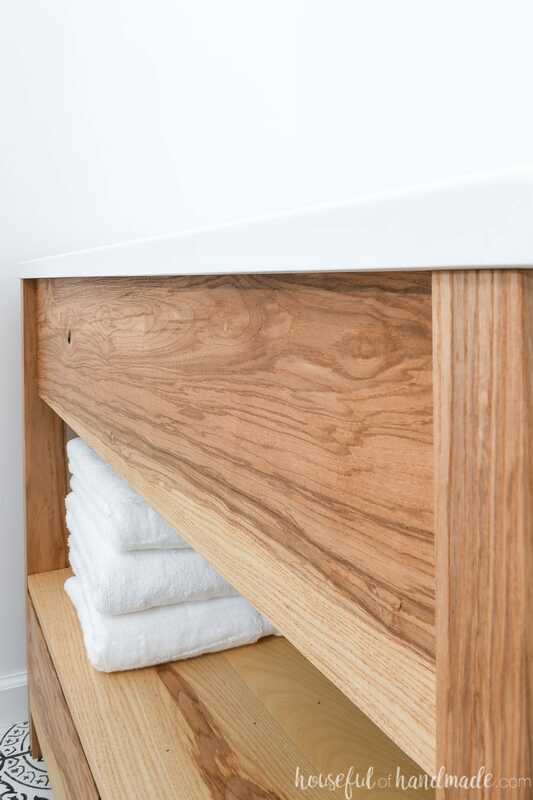 Because this bathroom is our guest bathroom, the idea of open shelves is even more amazing than just for looks. 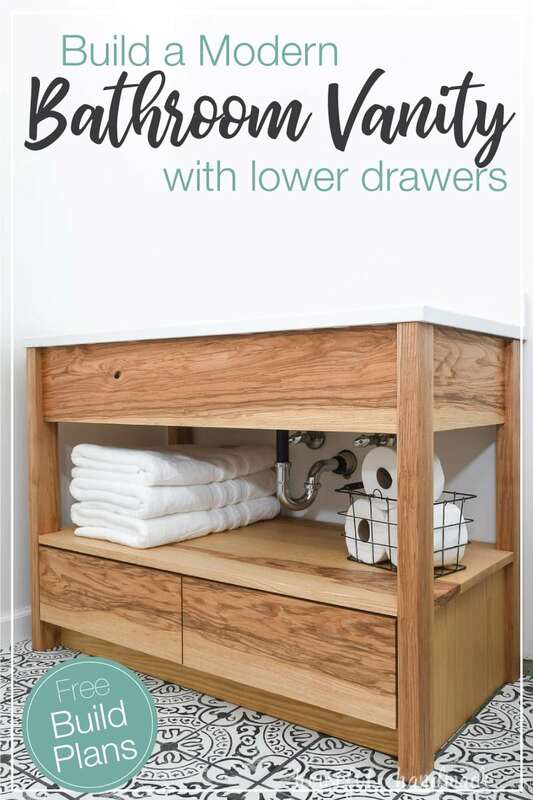 You can have towels and other necessities stored in the open so your guests don’t feel weird about going through your drawers. The other reason I love open shelves in a small bathroom is because they help make the space feel bigger. Instead of a giant closed in cabinet, they allow for more space in the room visually. But we also needed storage. 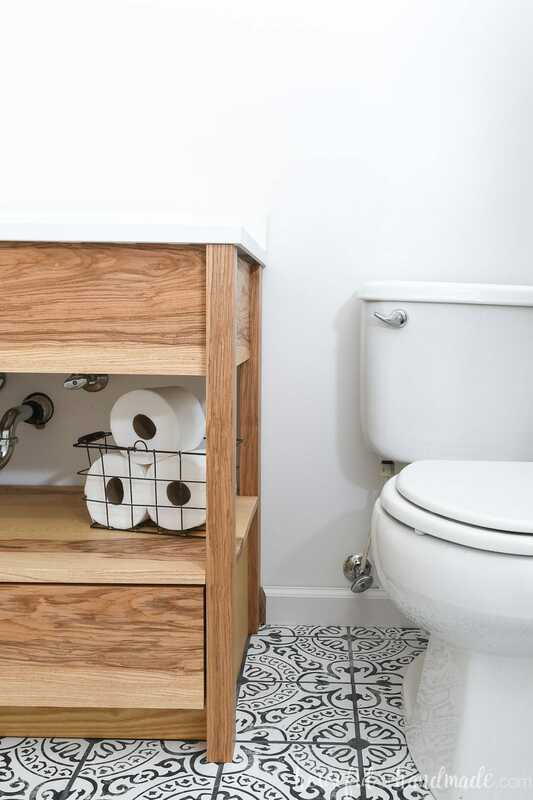 Even though it is a guest bathroom, I wanted lots of storage! Sometimes I use the storage in the guest bathroom to store things I don’t need to use very often. It a bonus spot for those weird things I need a couple times a year! To keep with the modern bathroom vanity feel, we put the drawers on the bottom of the cabinet instead of the top and I love it so much more! 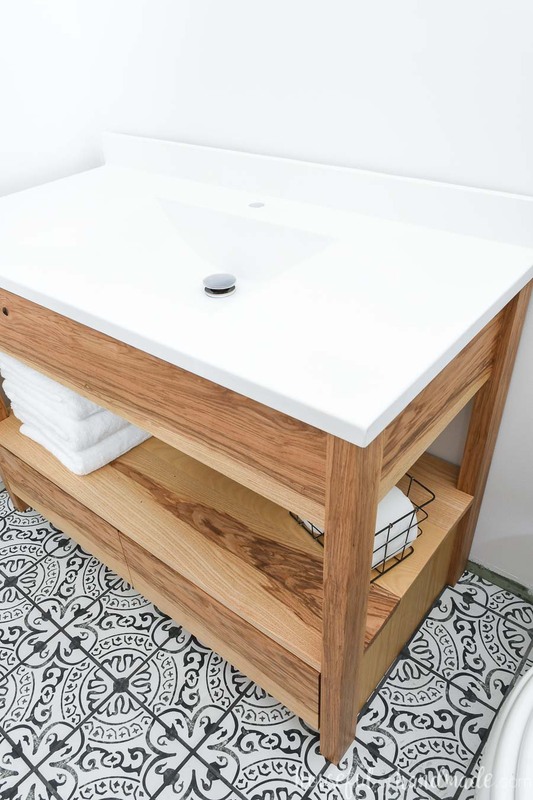 Putting vanity drawers on the bottom means the drawers can be larger because you don’t have to leave room for the sink and plumbing. Just look at all that storage space! 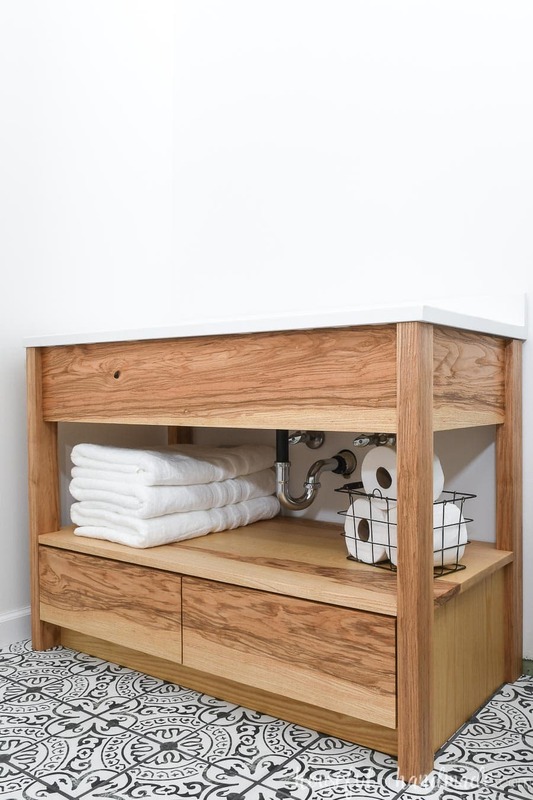 To keep everything on a budget, I designed this DIY bathroom vanity to be a standard 42″ bathroom vanity. That way, it can fit an off-the-shelf vanity top. The cost saving of buying a pre-made vanity top was great. But I also love that as soon as we finishing installing a bathroom vanity, we can quickly install the sink and be ready to use it. It makes this bathroom vanity project truly a weekend project! We chose this simple white vanity top with seamlesss sink. I love the clean lines and it almost disappears into our white walls. So now the beautiful wood of the vanity is the focal point. And let’s talk about the wood we used for our DIY bathroom vanity. Because bathrooms tend to have a lot of water in them, I prefer to use hardwoods to build the cabinets. Hardwoods will hold up better over time, and we all know how much use a bathroom can get. I knew I wanted a wood that was beautiful all on it’s own. Something with grain and character. So we went to our local lumber yard and found this beautiful ash wood with lots of color variation. Since this build is a simple one, I decided to test my skills as a woodworker and mill my own boards. This required me to buy raw boards and plane them to the proper thickness. Then cut the sides straight and the width of the boards to the proper size. It was a fun test of my skills, but I know that not everyone is ready to do that. So I made sure to use standard lumber sizes with all my boards so you can buy pre-milled boards to build this vanity. To make the build process quick and easy, I used the Kreg Jig to join together my boards. This little tool makes super strong furniture that I can be confident in. But the pocket holes are easy to make with just a drill and the jig. 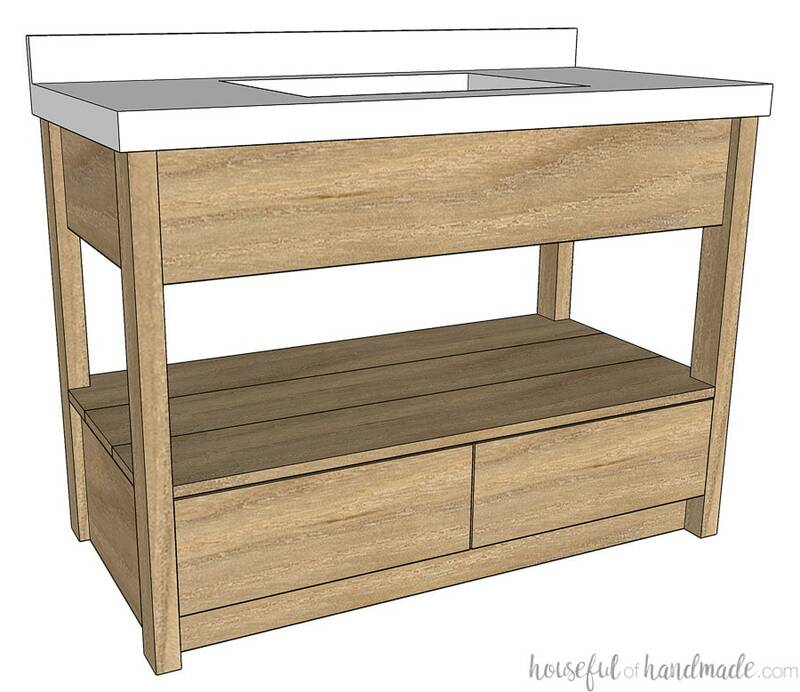 If you are ready to build this beautiful, modern, 42′ bathroom vanity to update your bathroom, I am sharing the plans for free over on BuildSomething.com. Click here for the complete DIY Modern Bathroom Build Plans. Thank you to Kreg Tools and BuildSomething for sponsoring this post. I only recommend products that I use and love and all opinions are 100% my own. Click here to read my full disclosure policy.